This hearty chicken dish is simple, yet delicious. It is quick to prepare and ideal for lunch or dinner. Place the baby potatoes in a saucepan, fill with water and add a pinch of salt. Bring to the boil, then reduce the heat and simmer for 20 to 30 minutes, until the potatoes are cooked through. Drain the potatoes and while still warm, place them on a baking tray and press with a potato masher to lightly crush them. Drizzle with some of the olive oil, scatter over the Parmesan and season with salt and pepper. Set aside until ready to roast. Heat an ovenproof frying pan with a little drizzle of the oil. Pan-fry the chicken for 3 to 4 minutes on each side, until nicely browned but not too dark. Transfer to the oven for a further 15 to 20 minutes, until cooked through. Place the tray of crushed potatoes in the oven to roast for the last 10 minutes of the chicken’s cooking time. When the chicken is cooked, remove it from the pan and keep warm. Place the pan back on the heat and melt the butter, then pour in the white wine and let it bubble up. Add the spinach and cook for about 30 seconds, until it has just wilted. Season with salt and pepper. 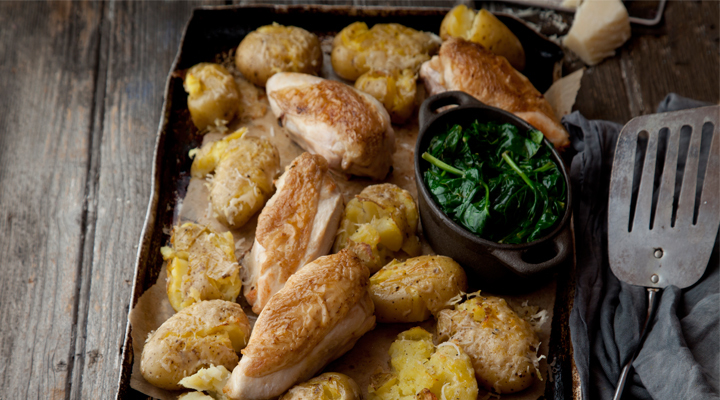 To serve, slice the chicken breast lengthways and place on top of the crushed baby potatoes with the wilted spinach on the side. This dish was lovely looking forward to making more dishes .